Providing the Atlanta South area with professional, fast and eco-friendly junk removal services. Every one of us a gotten into the habit of recycling. If provided with the designated recycling bin, we will happily toss in our soda cans and water bottles. This routine started at home and extends to workplaces and campuses. That is the easy way to recycle. But what happens when you need to get rid of something like an old stove or refrigerator? Yes, those big appliances can be recycled as well but you won’t be able to stuff them into a bin. Instead, you’ll want to hire Junk King Atlanta South. These are the professional junk haulers who been recycling appliances for over it 12 years. Typically, most people get rid of their big appliances on the same day they get the replacement models delivered. However, there could be an instance where you might have to put an old refrigerator or freezer out in the garage. It might be easier to shove the old stove or dishwasher onto the back porch. The hope is that you can get it removed on your own but that often proves impractical. With Junk King Atlanta South on the job, you only have to point to something and it can be removed by the two-man team assigned to your session. You can book your junk removal session with Junk King Atlanta South at the time that works best for your busy schedule. You may want to time it so that the old appliance is removed on the same day the new appliance is being dropped off. Junk King can certainly make that happen and give you plenty of time to clean up that empty space before it is filled again. Junk King Atlanta South has established partnerships with various recycling facilities throughout the region. They know exactly who accepts big appliances versus electronics. There are also different recycling centers for furniture, mattresses and other household goods. What if your appliance is still functioning? Then junk King will happily drop it off at a charity that can polish it up and turn it over to a family in need. 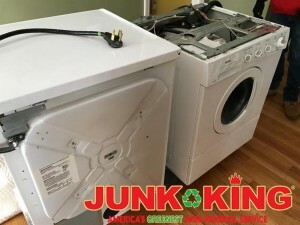 There’s no reason for your big appliance to end up in a landfill with Junk King Atlanta South on the job. This entry was posted in Atlanta South Appliance Removal and tagged big appliance, junk king, junk removal, recycling on October 22, 2017 by Junk King. Last updated October 22, 2017 .